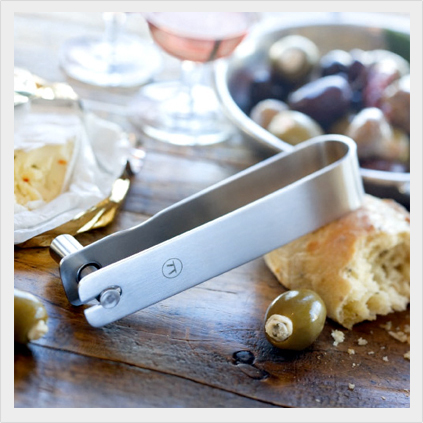 The Olive Express not only fills olives for all your martinis and bar drinks, this innovative stuffer is priceless when creating chic hors d'oeuvres, mouthwatering appetizers and treats to satisfy any sweet-tooth! Whether you're entertaining a couple or a crowd, prepare several batches of these elegant stuffed martini olives to adorn your cocktails. Simply PICK UP your crumbled blue cheese (we like a sharp blue such as Garganzola), PLACE the Olive Express into a pitted green olive, and SQUEEZE the Olive Express together to release the filling into the olive. Voila!...your Blue Cheese Buddah is ready to adorn your cocktail! To adorn an hours d'oeuvres tray, serve as a finger food, or embellish your entree...these innovative recipes are delicious, fun and sure to please everyone! These are always a big hit at parties. Pair with an Italian meal or serve alone. Guests won't believe the stuffing is plain cream cheese! Use your Olive Express to PICK UP the cream cheese, PLACE the Olive Express into an olive, and SQUEEZE the Olive Express together to release the filling into the olive. Place stuffed olives on a serving plate, drizzle with dressing, and sprinkle with parsley. Let your imagination be your guide! Whether tomatoes are round or pear-shaped, use your Olive Express to stuff these tiny gems with any of the scrumptious fillings. These are great to pair with any of our stuffed olives! Fillings accommodate twenty-four (24) cherry tomatoes. We like to use a mixture of red and yellow tomatoes. Cut top off cherry tomato. Scoop out pulp with a small spoon or mellon baller and discard pulp. Place the tomatoes, cut sides down, on paper towels and let drain for 15 minutes. Prepare filling. Use your Olive Express to PICK UP the filling, PLACE the Olive Express into a cherry tomato, and SQUEEZE the Olive Express together to release the filling into the tomato. Bon Appetite! Mix all ingredients in food processor until well blended. Stuffing juicy olives with the Olive Express using all the scrumptious combinations leads to fantastic results. But breading and frying them after they've been stuffed are a pure taste sensation! The most exciting thing about these olives is that once fried, they all look identical; which means that you never know what filling you are getting until you dive into the plate. A classic bar snack commonly found in Naples, fried stuffed olives are simply superb with a rich, red wine...or with a glass of bubbly! 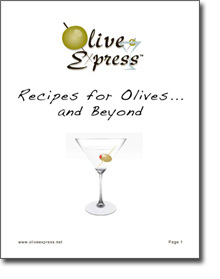 Using your Olive Express, stuff the olives with your choice of fillings. Spear a stuffed olive with a toothpick and twirl it in the flour. Swirl it in the egg. Use a fork to pop the olive off the toothpick onto a plate. Repeat until all of the olives are coated. These little desserts look gorgeous and taste fabulous! Perfect for a tea or shower ...or when that special-someone comes to visit. Hull strawberries and gently scoop out a hollow depression for filling. Rest the strawberries upside down on paper towels until ready to fill. Beat cream cheese, sugar, and almond extract until combined but still stiff. Use your Olive Express to PICK UP the filling, PLACE the Olive Express into a strawberry, and SQUEEZE the Olive Express together to release the filling into the strawberry. Arrange strawberries on decorative plate. Sprinkle pecans on top of the stuffed strawberries. Cover and refrigerate until ready to serve.